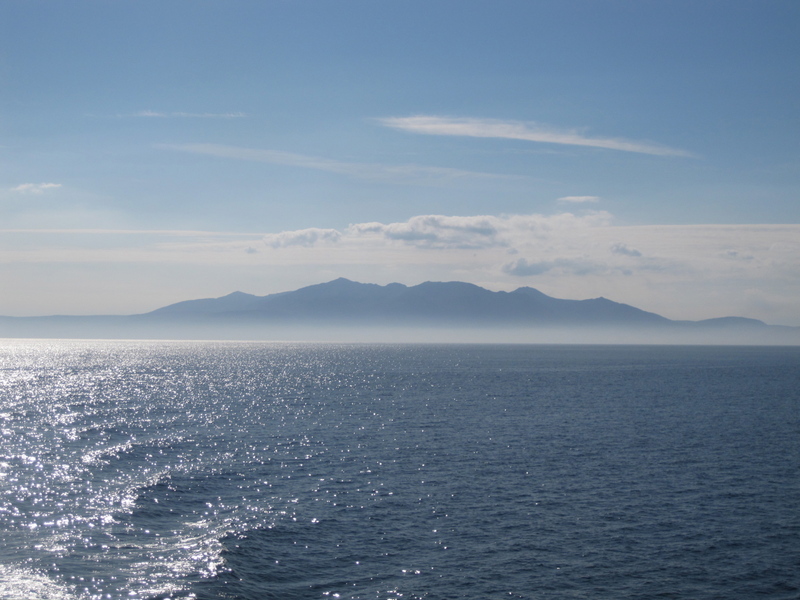 The Isle of Arran is off the West coast of Scotland near Ayr. 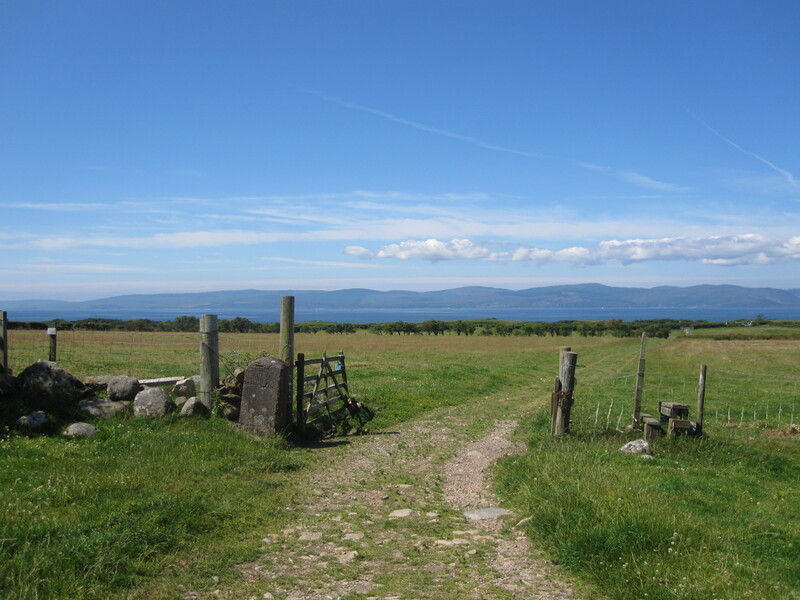 From the mainland, it looks mysterious, with stormy clouds above or mist from the Firth of Clyde surrounding it. 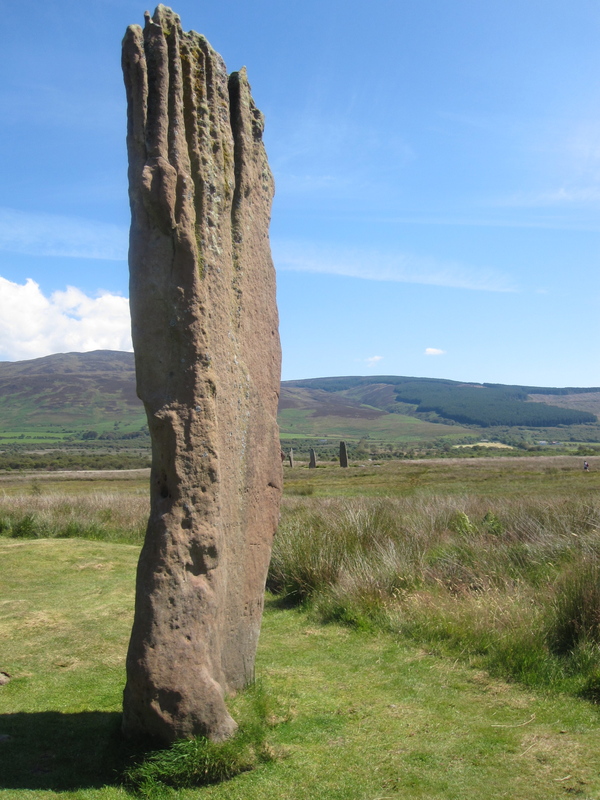 Adding to Arran’s mystery are the Machrie Moor Standing Stones, a series of stone circles estimated to have been placed there about 4,000 years ago. Like Stonehenge in England, the purpose of these stones is not quite understood. 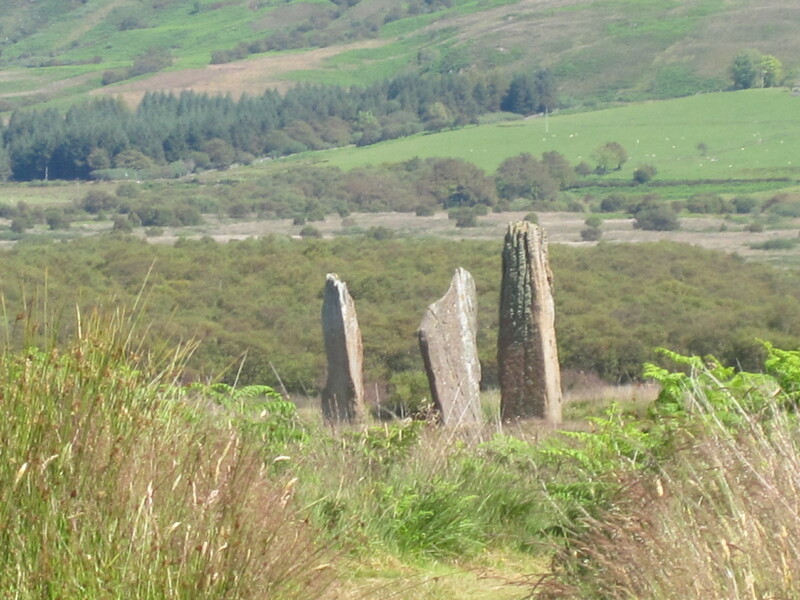 The three main stones in the area, what remains of a larger circle. Unlike Stonehenge, the area is not heavily touristed. There is no entrance fee, not much signage, no barricades blocking access. 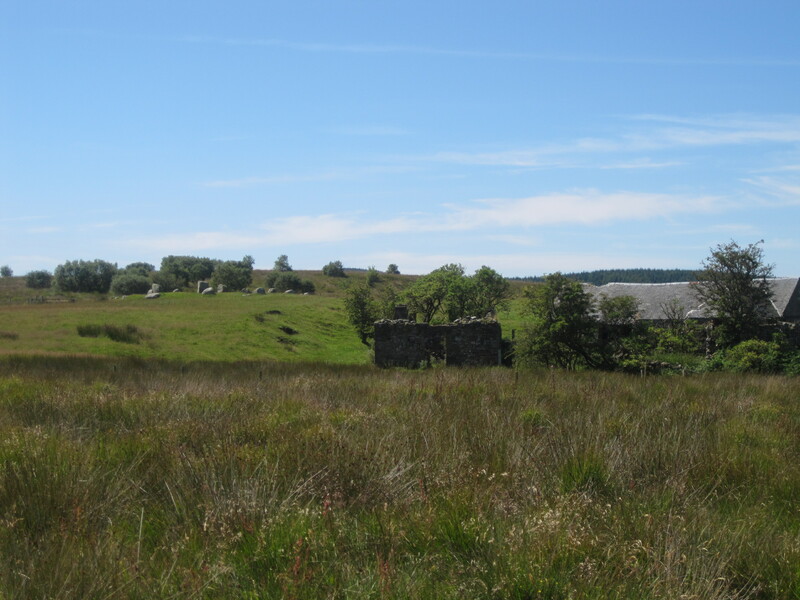 To get to them, you walk through sheep fields, hop some fences, and follow a path into the peat moors a few kilometers off the road. I understand in museums the concern over artifacts being damaged. But you can touch these stones, sit on them, smell their earthy, mineral coolness. It feels right to interact with this solid connection to our past as humans have done for thousands of years. These things are really huge! Sometimes in museums, it seems like we see ourselves at the end of time, looking back on an entire history that we know, teach, analyze. Look at what those silly early humans got up to without the advantages of our post-modern age. It feels like a closed book–where do we go from here when we know and have done everything already? 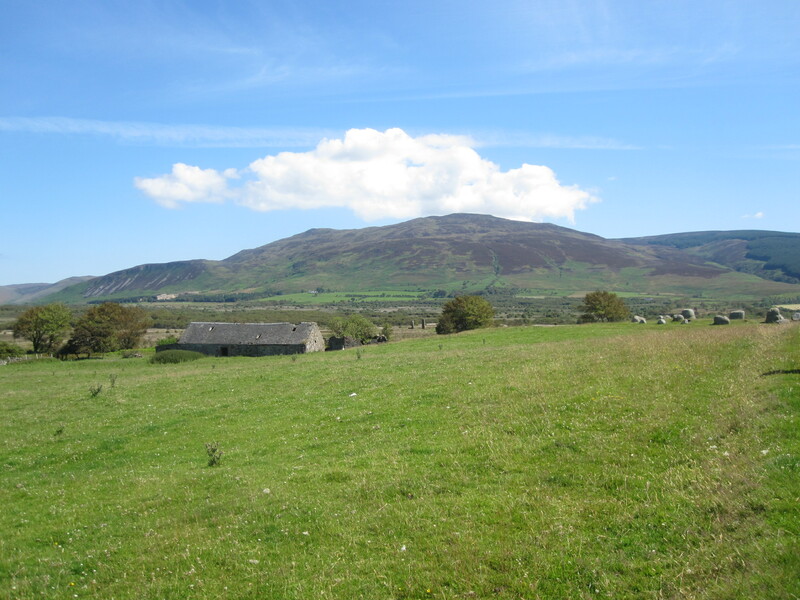 An old farmhouse sits below "Fingal's Cauldron," a double circle of stones. But looking up at these impressive stones, I had the opposite sensation–that we really don’t know everything, that we’re not somehow at the end of human experience. In fact, there is still so much we don’t know–things we don’t know now that the people before us understood. It’s both unsettling and reassuring. 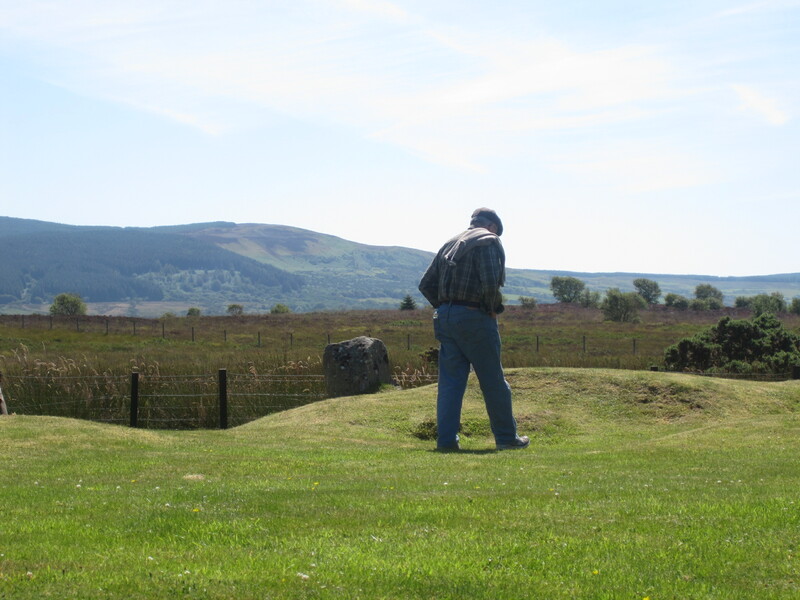 My dad, over a partially buried circle that is thought to be the special grave site of an important person. I was also moved by the idea that it could have been my Scottish ancestors who somehow stood these giant stones up in this field. 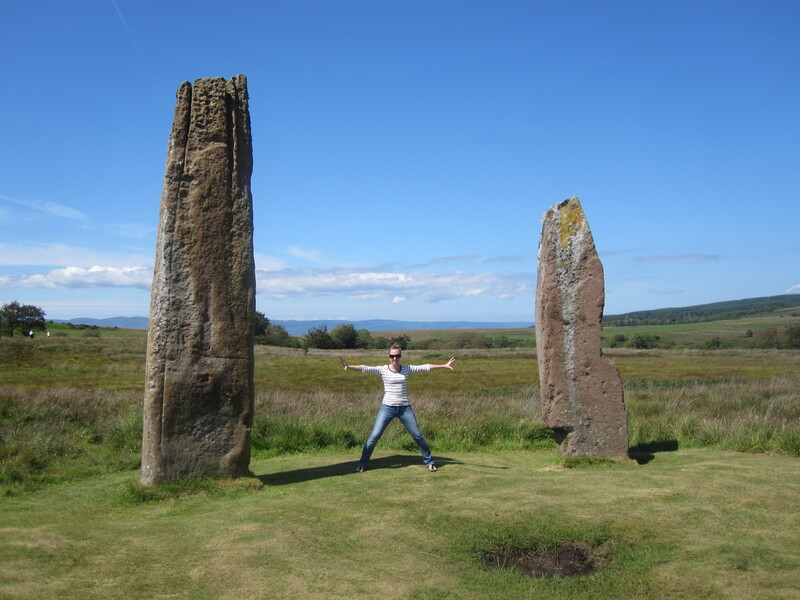 There was something about being in front of these solid, little changed monoliths rooted in a peat bog that made me feel a deeper, more primal connection to my roots than I’ve ever felt before. This one stands alone now, with the three in the background. We were there on an impossibly sunny, beautiful day. Whoever thought it would be difficult to take pictures in Scotland because it was too sunny? Whoever thought we’d get a sun burn? We had a lot of time to mull over the significance of this place since the bus only comes every 3 hours (a fact we neglected to take into account). Had Kirby been with us, we would have had a lovely picnic. As it was, we were rationing bits of shortbread cookie from the plane. Nevertheless, we still managed to entertain ourselves. 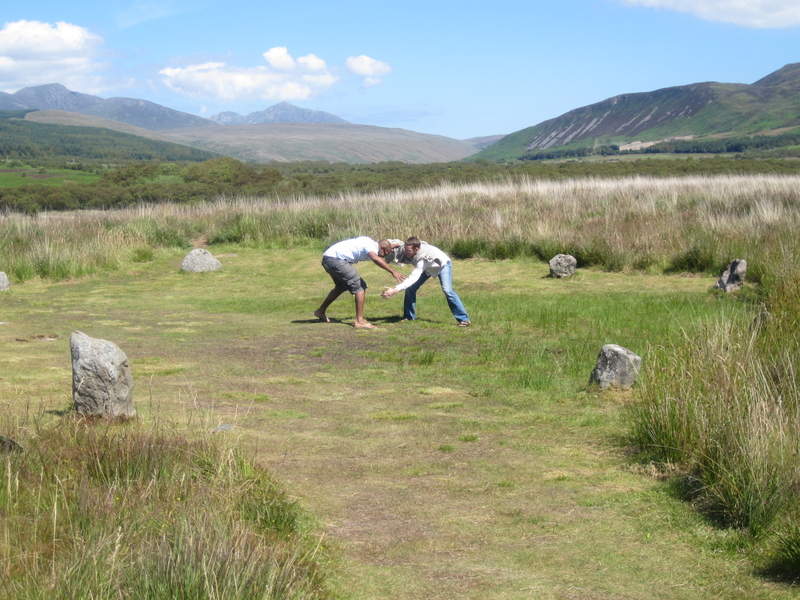 What is it about boys–they get inside a 4,000 year old stone circle and they feel compelled to wrestle…. I think I understand how you feel. When I’m around some of the monuments down here, I can’t help but feel thoughtful about the persons who built them or were connected to them. It’s a bit humbling at times, but reflection can be a good thing. It’s a very neat feeling for sure! I’ve always felt proud of things in America, and my Scottish heritage as well, but it was just different seeing things in the country (or one of the countries) that my family comes from. Very cool! ha, ha I like the last photo. And the one…two photos above…does it look like a hand with long fingers and a wrist to you? It does look like a hand!